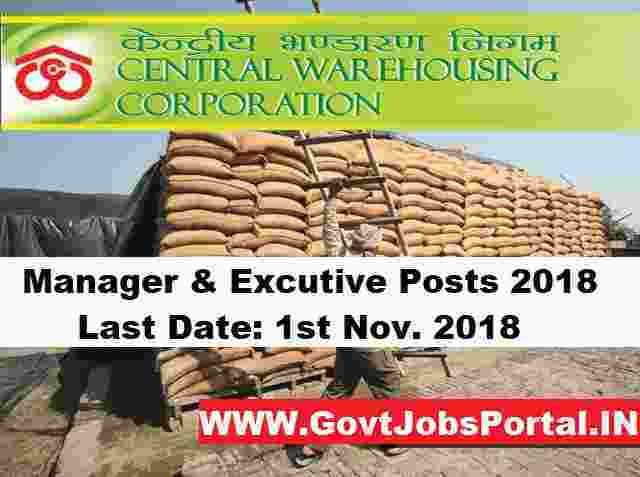 Central Warehousing Corporation Recruitment for Managers posts 2018. Central Warehousing corporation is an organization which is Schedule-A Mini-Ratna, Category- I, Central Public Sector Undertaking under the administrative control of Ministry of Consumer Affairs, Food & Public Distribution, providing Scientific storage facilities for agricultural inputs, produce and other notified commodities besides providing logistics infrastructure like CFSs/ ICDs, Land Custom Stations, Air Cargo Complexes etc. for import- export cargo, invites application from eligible candidates, who fulfil the prescribed qualification, experience, age etc., for the posts indicated below in this article. (ii) For the posts mentioned below in this article, in addition to Basic Pay & IDA, other allowances/ perks as per the policies of the Corporation from time to time. (iii) Employees of the Corporation in regular pay scale are also entitled for other allowances/ perks such as CPF, Contributory Pension, Gratuity, LTC, Performance Related Pay or Performance Linked Incentive as per admissibility, reimbursement of medical expenses for OPD treatment/ hospitalisation of self and dependent family members as per eligibility, as per the policies of the Corporation from time to time. (iv) Reservation, age relaxation and other concessions to reserved category candidates would be applicable as per Govt. of India orders; wherever posts are reserved under these categories. (v) Departmental candidates applying under direct recruitment will be entitled for age relaxation subject to the condition that as on last date of receipt of application, the candidate should have at least 5 years of service left. (vi)The number of posts indicated in the advertisement is tentative and may vary as per actual requirement of the CWC. The persons with the Degree of Disability of minimum 40% are eligible for applying for the posts earmarked for PWD Category. Wherever posts which are earmarked suitable for PWD category but no vacancy exist in that particular category of disability; candidate will not be considered for any relaxation/ concession at any stage of recruitment. More information about these Government jobs under Central Warehousing corporation is given below in this article. So read it carefully before applying this Central warehousing recruitment process 2018. (i) Candidates should get prepared the demand draft/ banker’s cheque/ pay order of the requisite amount as detailed at ‘G’. (ii) The same should be enclosed with the application form. Necessary details of the financial instrument enclosed with the application form should be filled in the requisite columns of the application form. (iii) Applications without the requisite amount of application fee shall be summarily rejected. No other mode of payment shall be accepted. (iv) The demand draft/ banker’s cheque/ pay order should be in favour of the Central Warehousing Corporation and payable at Delhi. 1st Nov. 2018 is the Last Date to apply.